Tips on how to design a fun child room. When it comes to children’s decor, airy rooms with colourful details are always better. To achieve both space optimization and good design, we’ve outlined key tips. These tips make an 8 to 12 year-old’s bedroom feel safe and comfortable so they can play all day, all night, and all by themselves. A space to call home. Give friends a place to set their stuff. A stool and stand creates more floor space — and more room to play! A hanger works just fine, too. 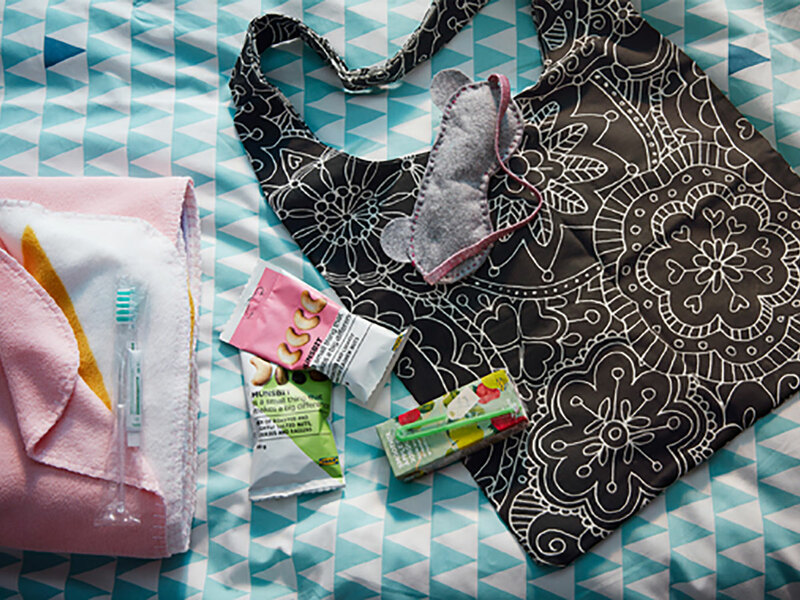 Kids can also organize a welcome kit with snacks, a soft blanket and small toiletries. Dialogue door. Stickers with erasable surfaces are a playful way for parents and children to talk to each other during the sleepover. Kids will appreciate the privacy, too. Speak in shapes, or in emoji. Hang chalk and an eraser on the door to avoid messes. Bring out the bedding. A rollable storage unit is easy for kids to move themselves. Pull out the box to reach extra pillows and the guest’s bedding, then push it back into place. They can use the sheets for sleep…or for building something. Fort by day, bed by night. These lightweight mattresses are easy to move around and play with. Children can fold them into a fortress, or flatten them into a comfy guest bed. Use two for extra padding. When it’s time to wake up, slide them back under the bed. Late-night laughs. Soothe nighttime nerves so nobody will be scared of the dark. Motion sensor lighting guides guests to the bathroom. Stick them to the wall for a clear path.